I'm catching big trout on dries. It's hard not to feel like you know what you're doing when you are laying out 60 ft casts and catching big pressured trout. I'm on top of the world some of these days, others have left me humbled... East Branch slow water fish are tough as hell. And when you fool them don't freek out. I did. There are some images that will stick with me till the very moment I leave this world. The lights from the house on the top of the cliff were turned off. I startled a little. The darkness engulfed everything all at once. I could no longer see clearly the chaos that was going on around the rocky flat, but it was still very audible. Were there beavers all over the river? That's what it sounded like. Tons of beavers tail slapping everywhere. Pops, slaps, and violent thrashing echoed up and down the river. With the light out the knot I was tying suddenly became impossible. I flipped on my headlamp. There was splashing a under my rod tip. I looked up, assuming my light had spooked some herring. I saw two blueback herring come shooting upstream on an erratic, zig-zaging path. I looked behind them, knowing full well they were being chased by something. At first I didn't see it. Then out from behind a large grey and brown rock came a ghost, it's tail barely flicking to propel it the five or six feet from the rock to the point directly below my rod tip. It slowed and almost paused there, close enough that I could see it's eye clear as day. I was looking into the eye of a striped bass over 40 pounds, truly a miracle caliber fish for a fly roder. . It seemed to look back at me and say "not yet". And with another abrupt yet light flick of the tail, it was gone, up stream and out of sight. It took me 10 minutes to get that knot tied to satisfaction. Thursday, May 25th, 6:10 P.M. I hit the road. These days were numbered. I felt that now. The run does not last long. There was a lot of urgency in everything I did to get ready, and I felt rushed to get on the water and start fishing especially knowing that I wouldn't be in the state in three days. I'd be gone for what would likely be the very last blast of the herring run. I could end up coming back to the last little bit of the run or nothing at all. I had to get it done. Must get it done. It NEEDS to be done. I got to the river and almost bronzed my jeans. There were more herring out than I had ever seen in one place. I mean this place was positively full of fish. One of the many small braids was so full of herring that when I shined my light on it after dark I could see fish from one side to the other, and some actually jumped onto the bank attempting to escape me. The tide was low, so I moved downstream to intercept fish that would slowly work their way up as the level gradually increased. I found some, but getting my fly in front of the fast moving schools was difficult. Surprisingly I did get a decent smallmouth on a 10 inch "beast" fly. Eventually a quick, accurate cast was rewarded with a mid 20 inch striper. After a short time I worked my way back up to the rocky flat. Things were happening there now. It really was chaos. Fish busting everywhere, herring trying to both spawn and stay away from the stripers, osprey and heron watching the water and picking up the stragglers... life everywhere. Violent, beautiful, deadly life. Convergence. With lightning and occasionally threatening to tear a hole in the sky and let all the water out I kept swinging my fly through the areas where fish were crashing, hoping for that 40 pounder. And when I hooked up and it wasn't a 40 pounder, I was not at all disappointed. I road home in a steady soaking rain, feeling more alive than ever. Ben Bilello pulled into my driveway. I'd been reporting to him my luck many nights. Ben was playing the spring run game years before I caught my first striper in freshwater. Unfortunately this spring's odd patterns have not been beneficial in the spots he usually fish's so I extended the invite. When we got our first look at the river I thought to myself "why did I not think about this?". It hadn't rained that much, but the river was much higher than it had been and the clarity was highly compromised. The first few casts we took brought my confidence roaring back. Ben got a crazy blowup on a black tube fly, and I had a 30 inch fish swirl to my fly at leader-length. Five casts later I was hooked up. After a handful more chases and blowups in quick succession, I figured out what was going on. The higher flow and murky water had made the fish a lot less shy. Instead of chasing and inspecting the fly they hit it at first glance, likely because the couldn't see us or the fly line and had to be quicker about eating in the fast water. This ended up being the most active night I had there, and I felt terrible because Ben missed and dropped every fish that took his fly... it's the same thing that happened to me my first two nights here this year, and even though I was having incredible luck I badly wanted Ben to hook up. Unfortunately we lost the bite when it got fully dark, and never got back into fish. I managed four tonight. 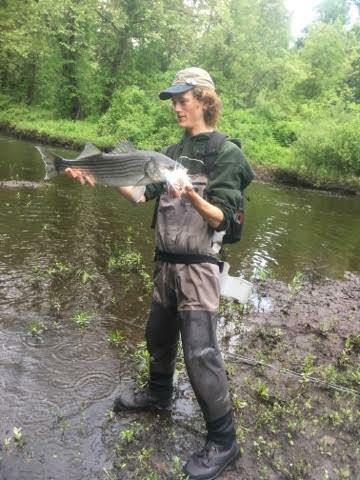 None were really big, but the largest was one of the most well fed stripers I've held. It probably had quite a few herring before it grabbed my fly. Saturday, May 27th, 7:00 P.M. There are times when I probably shouldn't go fishing. This was one of those times, but I had to. There's something about stripers... when they are in and the fishing is good I get extremely frustrated when I can't fish for them. So I went fishing the night before leaving for NY to fish for a whole week. Noah and I met Dan at the paring spot and climbed down to the river before it had gotten dark. There were herring there, and they were exhibiting behavior that suggested the presence of predators. It ended up being a couple hours with no touches whatsoever. Darkness fell and I began to doubt whether I would catch a striper on my last night at this magical spot during the run. Then I got an eat. It came at a very bad time. I was actually texting. with the rod under my arm and my fly hanging in the run downstream. As I put the phone back in my pocket and tried to pull my fly up something pulled back. As I was fighting my fish Noah nailed into a schoolie of his own. His fish took the plug deep, and unfortunately it took two people to save that fish. Dan was out of the game when it counted most. I released my fish and almost immediately hooked into another significantly larger one. It didn't fight as well as most 30 inchers do in the water, but when I lipped and lifted her she beat the piss out of me! I was ecstatic. This was the send off I was hoping for. And that was it. The bite lasted about 15 minutes, no more. When we were climbing out I couldn't help but think how this could be the last night I get to experience this, at least until next spring. 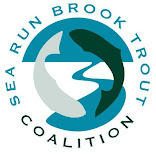 And it's no secret the CT's river herring runs are in bad shape, and the bulk population of stripers decreases every year. Like a parachute miles above the earth on a dark night, we slowly plummet into the unknown. Will it happen again? Where will I be? How good will it be? "This is the end. Beautiful friend. This is the end. My only friend, the end." This was bad. I mean how did I not see this coming? Actions have consequences, and sometimes inaction has consequences too. In this case it was inaction. First off, I had given this spot a near two week break. That meant I was no longer in tune with the cycle. Second, I didn't even think to check the charts before I left. The consequence of my inaction was my being forced to stay on an island over night because the tide cut off safe wet wading exits before I was ready to leave. Oops. I left Tuesday evening at 6:30, pretty much on a whim. I wasn't sure there'd be stripers and herring, so I brought the 5wt and the 8wt. Smallmouth and perch would certainly keep be happy if there weren't line siders. I got there right at low tide and didn't see any activity to indicate there were herring, so I tied on a small silverside pattern for smallmouth. I ended up with a handful of decent river bass and a few really nice yellow perch and redbreast sunfish as well. As the tide began to come in, however, I started to see big wakes and boils. The fish I was really looking for had arrived! I rigged the 8wt and tied on a white, blue and pink Popovics "Beast Fly". It took 15 minutes to get a blow up. 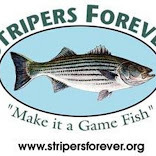 A decent striper hit once, twice, then three times. The hook never found mouth. No bother. Not long after the "Beast" got trashed when I wasn't looking. Still ready, I stripped hard and the fish was on. This was not a giant by any stretch of the imagination but a decent striper regardless. Not long after that, I nailed into another fish. This one was a but larger. It fought incredibly well and actually jumped on the hook set. Stripers don't often jump but in this shallow water fish have no choice but to go up and out sometimes. It was while I was releasing that fish that I realized I had messed up. My little rock island had gotten significantly smaller. I really struggled to cross the channel between there and the next island, and I made it about half way across the channel between that one and the bank and realized that just wasn't going to happen. I decided I should probably check the charts. I was about halfway into the incoming tide on a new moon... it was going to be a really long night. I'm always ready for an emergency, and I was well equipped to spend the night. I made sure I could cross to the next island which is the biggest of the three, and fished until the tide was right below comfortable crossing. I gathered my gear and carried it over to the big island where I began building myself a shelter. If I was going to get any sleep at all something to keep me out of the open air would be a big help. The process of making the shelter would also keep me occupied and warm. 45 minutes and I had myself a comfortable little shelter. Now to wait for the tide to at least get low enough to start fishing again... it would be a few hours. I got maybe 45 minutes of sleep. When the time finally came to get back to fishing I was absolutely exhausted. In a total daze I wandered over to the spot and began making really terrible casts to a slot I knew would be holding fish. I'm not exactly sure how it went down, but I somehow hooked and landed a fat thirty inch striper around 2:00 in the morning. I got home at 6:00 a.m. I fell asleep at 7:00. And I woke up at 2:15 p.m. Don't do what I did. It was brutal. Yesterday I made a visit to my favorite smallmouth lake. I fished from shore with big dragonfly nymphs, the way I catch most of my smallmouth from this body of water. The first couple of fish were not very big, but a 3 pounder very quickly made up for that. She wasn't very long but she was super thick. A near continues stream of smallmouth was punctuated by the odd panfish. There really was a lot of activity on this morning. I even saw white perch spawning on a sea wall. I love smallies. They are a lot of fun on light fly gear, or any light tackle for that matter. Any day I catch a bunch of smallmouth is a good day. Interested by my minor success getting a wild brown on a mouse last night on my "part time home river" I decided I should try a mouse on my actual home river. During the day. Because, well why not? 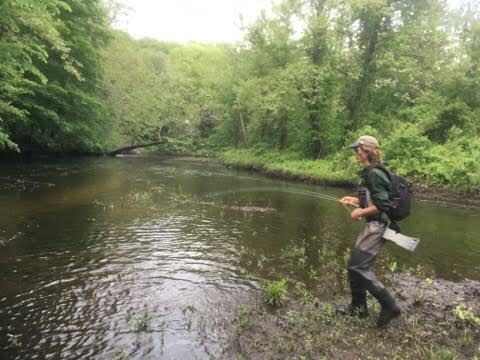 Small stream wild trout are dramatically more opportunistic than their big river counterparts, and the conditions were optimal for fishing a mouse during the day. It was cloudy, spitting rain, warm, and the water level had moderated nicely (WAY too late to get a good blue quill or hendrickson rise, but whatever). 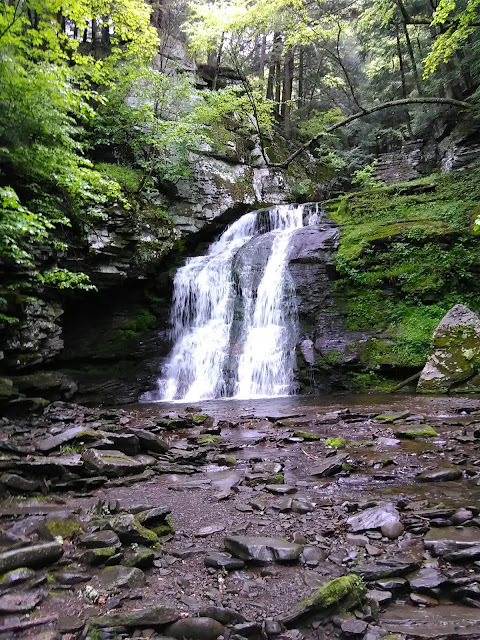 I was expecting a few pops and splashes here and there from wild browns, maybe a few stocked trout to hand. Best case scenario I would get a handful of wild fish hooked. That did not happen, but I did have two takes that were clearly large wild trout, and plenty from small fish. No surprise at all, I caught stocked brookies, salmon smolts, and one rainbow. 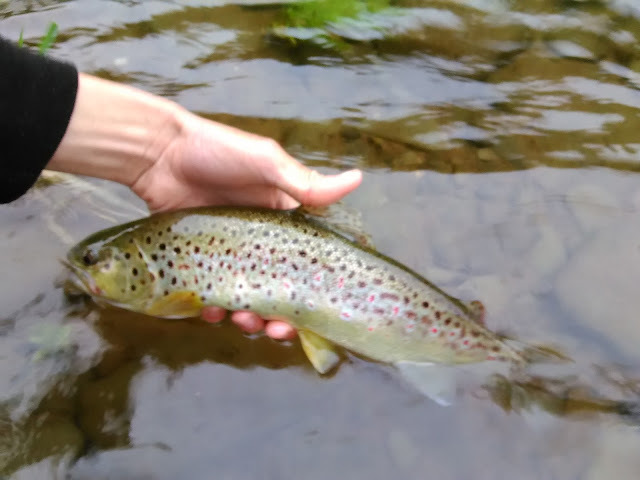 It was cool to see a few wild trout go for the mouse during the day, especially since two were way above the size I've been seeing here the last two years. A hookup would have been nice though. Was it worth experimenting with the mouse even though I knew it was far from the most likely thing to catch a good number of wild fish? It is always worth learning something new. But in this case, I chose the wrong day to mess around. There was a huge number of sulfur nymphs in the drift. Had I been nymphing with a size 16 PT, I would have had a field day. Oh well.